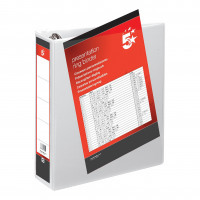 5 Star™ Office presentation binders, provide a good value, quality option for professional presenting. They are extra wide format for use with punched pockets and made from a heavyweight polypropylene over board for strength and durability. Clear pockets on spine and front cover for personalisation, with a pocket on the inside front cover to store loose documents.